Just before dawn, Peter Aschenbrenner's American 63ft Trimaran, Paradox powered through the finish line to complete the 600-mile course in less than two days. Conditions have been fresh to frightening right from the start and there has been no let up for over 500 sailors battling through exciting yet tough conditions. Next to finish will be Mike Slade's British maxi, ICAP Leopard to claim Monohull Line Honours, however ICAP Leopard experienced a slow passage to the south of Guadeloupe, preventing the team from getting near the course record. 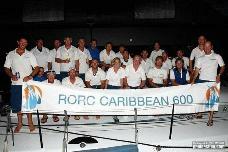 Any notion that the RORC Caribbean 600 is a jolly around the Caribbean has been totally dispelled. Warm conditions and spectacular surroundings apart, racing 600 miles in big conditions is taking its toll. Eight yachts have now retired from the race leaving 44 yachts still racing. The majority will not finish for at least another 24 hours if not more. This year, Guadeloupe Grand Large has entered three Figaro IIs for the race. At 33ft in length and crewed by just four sailors, the Figaro Class can be considered the 'coal face' of short handed sailing for the RORC Caribbean 600. Skippered by young sailors from Guadeloupe, the teams are taking their first steps towards high aspirations. Two of the Figaros are having a tremendous battle out on the water. At 0700, Arthur Prat and Baptiste Maillot had been virtually sailing side by side for 350 miles and were approaching Guadeloupe. No doubt their local knowledge will give them good speed around their homeland. The long leg from St Marten down to Guadeloupe has provided joy for some and pain for others as the yachts negotiate through the leeward side of the high mountains on the west side of the island. Hap Fauth's American JV72, Bella Mente approached Guadeloupe yesterday afternoon and compared to their rapid transit down from St.Barths, the race favourites virtually came to a grinding halt. As Bella Mente struggled for speed, as Filip Balcaen's magnificent Belgian Baltic 112, Nilaya came barrelling down the track closing fast. Nilaya made up an astonishing 40 miles in just a few hours to challenge Bella Mente for the overall lead. Nilaya's cunning move has meant the Belgian yacht is now winning the Superyacht class. Ron O'Hanley's American Cookson 50, Privateer also caught up and at one stage, Privateer was back on top of the overall leaderboard. However at 0700, Bella Mente had regained the overall lead, with Nilaya and Privateer needing to make up about three hours to prevent Bella Mente taking the RORC Caribbean 600 Trophy. In IRC One Simon de Pietro's Irish Briand 76, Lilla continues to impress and has now opened up an 8-mile gap on the water to lead the class and has a three hour handicap cushion, but there is still nearly 400 miles to the finish. Andy Middleton's British Beneteau 47.7, EHO1 have found another gear, showing great pace on the tight reach to Guadeloupe to move up to second in class. Colin Buffin's British Swan 62, Uxorious IV has dropped to third in class, but their extra water-line length should see the British Swan move back up the leaderboard on the reach to the North Sails mark at Barbuda. In IRC Two at 0700, the entire class were enjoying the tight reach south to Guadeloupe and waterline length has played a big factor on this leg. The Oyster 48 Scarlet Logic, co-skippered by Ross Applebey and Tim Thubron still have the lead in class and on the water and Scarlet Logic is two hours ahead on corrected time. Christian Reynolds' British Swan 53, Northern Child and Joseph Mele's American Swan 44, Triple Lindy both had a great night sail and move up to second and third respectively on corrected time. However, with lighter winds expected around the south side of Guadeloupe, Philippe Falle's, British Grand Soleil 43, Quokka LLYC will be looking to catch their heavy displacement rivals. In IRC Three, Jonty Layfield's, British J39, Sleeper still lead the class, but Valerio Bardi's Italian Swan 46, Milanto has closed the gap significantly. Adrian Lower's British Swan 44, Selene made the bold move of leaving Montserrat to Port, to take up an offshore approach to Guadeloupe. For now Selene has dropped like a stone on the leaderboard but the move may well pay off later for the British team. Video by acquafilms on Vimeo.